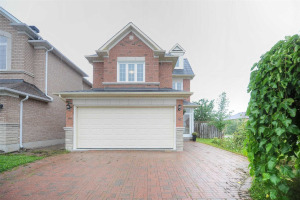 A Immaculate Stone Front Elevation Detached Home In Prestigious R/H Quiet Area W/Extensive Interlock Front Entrance/Driveway & Backyard. Surround By Forest And Park. Top Ranking School-Bayview S.S.. Mins To Hwy, Shopping, School. 2 Story High Ceiling @Foyer. 9 Ft Ceiling On Main. Hdwd Flr Thru-Out Main And 2nd Flr Hall Way. Like 2 Maser Br. Pot Lights. Crown Moulding. Art Niches. Granite Counter Top & Island And Custom Backsplash. Outside Roof Pot Lights. Brand New S/S (Fridge, Stove, B/I Dishwasher, B/I Microwave Combined With Range Hood). Washer/Dryer. Existing Window Coverings, Existing Elf. Gas Furnace, Cac, Cvac, Hwt(R). Water Softener. Garage Door Opener &Remote.